Possible memory solution for the Galaxy S4? Smartphones and tablets may be due for a significant memory boost in the not so distant future, as Samsung announces that it has developed a chip that can hold up to 128GB of NAND flash storage. 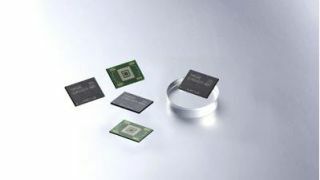 Samsung's new eMMC (embedded multimedia card) Pro Class 1500 chips are now entering mass production, bringing large storage capacity to a slim 12x16 millimeter chip to fit in mobile devices. With 128GB of flash memory, the chips are the highest density embedded memory chips on the market. The new eMMC Pro Class 1500 chips are efficient little things too, with data read speeds up to 140MB/s and a write speed of 50MB/s. It can also perform random data reading and writing processing up to 3500 inputs per second or 1500 outputs per second. Coming soon to a tablet near you? No devices have been announced to use the new eMMC chips yet, but when they are it could usher in a new era for smartphones and tablets. One smartphone you shouldn't expect to see with 128GB of memory is Apple's eventual next iPhone. Apple is trying to wean itself off of Samsung memory with the iPhone 5, and that trend isn't likely to reverse anytime soon. Of course, Samsung is keeping quiet for now about how much the new eMMC cards will cost. If smartphones already have a $100 markup when jumping from 16GB to 32GB of memory, we can only imagine what the leap to 128GB will bring.